Whether you decided to purchase the necessary chimney cleaning supplies to do the job yourself, or hire a professional, according to the Chimney Safety Institute of America your chimney should be cleaned at least once a year. Performing a yearly cleaning assures the entire system is in safe working order, which will help prevent every homeowners nightmare when burning firewood....a chimney fire. The principal reason a chimney requires cleaning is to remove the buildup of creosote that coats the chimney's inside surface. Creosote buildup that isn’t removed can ignite and cause what could be a disastrous chimney fire. Temperatures of chimney fires can reach 2,000 degrees Fahrenheit, which then can warp metal or crack tile liners and at worst, set your entire house of fire. How Often Should You Clean A Chimney? Maintaining a regular chimney cleaning schedule to remove any creosote buildup avoids experiencing a chimney fire. Tip: Reduce the amount of creosote buildup by burning wood that is well seasoned. Since wet firewood will smolder and burn at low temperatures, the unburnt gasses adhere to the cold chimney walls causing creosote. Depending on the type of firewood you are burning, typically the wood should be allowed to season for at least one year before use, sometimes even two. 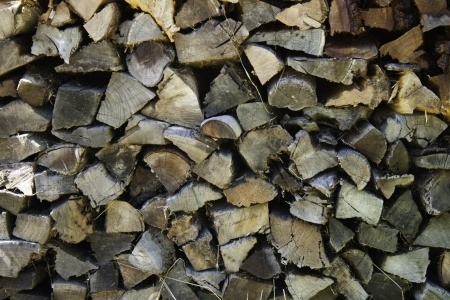 Seasoned firewood is classified as having a moisture content of 20 percent or less. The firewood pictured above is a good example of seasoned firewood. Notice the grey coloration of the wood and how the ends of the firewood have started to crack. These are two indications the wood is relatively dry and ready for use. Green firewood would have a much "fresher" appearance. The wood would be lightly colored, feel heavier and would not have the crack or check marks on the end. Before you decide to do the cleaning job yourself and purchase all the chimney cleaning supplies needed, you might want to watch a professional do the job first. Watching a professional will give you a good idea of how to clean the chimney and if it’s a job you think you can physically handle. 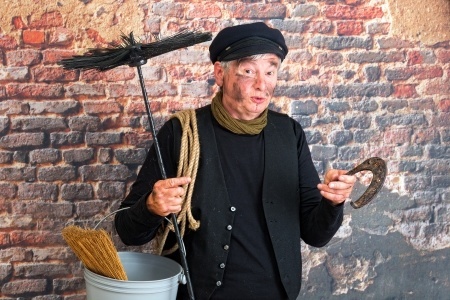 Remember, cleaning a chimney is a strenuous chore, as you will have to pull the chimney brush to the height of the chimney, which can be a back-buster and strain all sorts of muscles. If you don’t feel you are up to doing the task yourself, perhaps, let a professional handle it for you. If you feel you can take on the cleaning task yourself, there are basic chimney cleaning supplies you’ll need and pre-cleaning preparations required before you start the actual job of cleaning. There are various processes used to clean a chimney, but each relies on the same type of tools. Before you start the actual process of cleaning, gather up all your cleaning supplies and have them on hand so they are ready for use. Tip: Creosote is easier to clean from the chimney if the chimney is warm but not hot. Make sure there is no fire going in the stove or fireplace when performing the cleaning job. Chimney brush is the most crucial tool you will use to clean the chimney. Before purchasing a chimney brush, make sure you examine the chimney and measure its opening so you know the best type of brush that is designed to fit your particular flue. Chimney brushes come in a variety of designs, lengths and shapes, so you need to get one to handle your particular flue and the cleaning process you intend on using. The wire chimney brush will work best when it comes to removing the creosote buildup, though a heavy-duty nylon chimney brush fits through bends in the chimney. Rope and pull rings or chimney brush rods, depending on the method of cleaning you are using. Tarp, drop cloths or fireplace cover to cover the floor and any furniture to keep them clean. You can also seal off the opening of the fireplace to keep the debris contained. Flashlight to check the chimney for any obstructions. Mirror to be able to look inside the chimney from below. Duct tape to tape the fireplace cover, drop cloths or tarps in place. Bucket to hold any soot and debris you clean up. Goggles and dust mask to protect your eyes, nose and lungs from the soot and debris as you are cleaning the chimney. Old clothes you don’t mind messing up and work gloves, as you will want to protect your hands, and the task is very dirty. Ladder if you plan to clean the chimney from the roof down. Always have a second person holding the ladder as a safety precaution. Broom and dust pan to sweep the soot and debris into after cleaning the chimney. Heavy-duty shop vacuum to clean up all the soot and particles after the chimney is cleaned. The fine particles can damage a regular vacuum used for household chores. Once you’ve done a thorough job of cleaning the chimney, you will want to clean up all the mess it has made. If you have a fireplace, carefully remove the tape holding the cover in place so you can sweep up all the creosote and soot that has fallen to the bottom. Also, be sure to clean any debris from the smoke shelf located above the damper. You might have to use the chimney brush again to clean any remaining creosote that is stuck to the inside of the fireplace. Remember, if you keep your chimney in a clean condition, you'll be less likely to have a house fire and your chimney and the entire unit will operate safely and more efficiently.